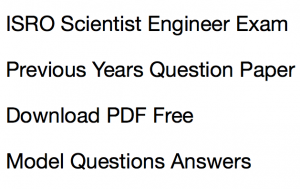 ISRO Scientist Previous Years Question Paper Download link in PDF format for Electronics (ECE), Mechanical (ME), Computer Science (CSE) have been given here with answer keys. Candidates preparing for the ISRO SC Engineer posts in Indian Space Research Organization may use the question paper and solve & study rigorously the previous years old question papers for respective engineering branch viz. Electronics & Communication Engineering, Computer Science Engineering and Mechanical Engineering. The Old questions paper will be helpful for preparing the current year’s recruitment exam 2017. 80 posts for various engineering departments ECE, ME and CSE were earlier advertised on the official website of ISRO which is www.isro.gov.in. Candidates having graduation degree in Engineering (B.tech / M.tech) are eligible for the post. Details about the recruitment notification may be found here. Previous Years Question Papers may be found below. The papers are given in PDF format year wise. This question papers are published on the official website. Below we have given model MCQ Questions Answers for all the subjects for ISRO Engineer Scientist Recruitment 2017. Solve this previous years question paper, and practice the MCQ Questions answers given here for performing better in the ISRO Scientist Question Paper for upcoming year. Previous Years paper 2017 2016 2015 and for other years with answer key may also be found in similar way. Get new information Click here. please update more and more MCQs for CSE.